"Ah, good! My child is old enough to play video games now!" Video games are often unfairly blamed for society's ills, with critics claiming they make players violent or antisocial. While some might assume such claims are a recent thing, a newly-translated interview with the team behind Super Mario World reveals that such unwarranted criticism has been playing on Shigeru Miyamoto's mind for decades. I want to see console games become a "destination for play" — a world that kids feel a kind of affection and attachment to, and want to return to again and again. And how awesome is it that kids have all these worlds they can visit, all inside a console and game library small enough to fit in a dresser? Also, as a parent my eyes have been opened to something new recently. I've noticed that when a parent sees their child reading a book, they think that's a good, proper thing. But sitting their children down in front of a TV to play a video game somehow makes parents feel guilty, even though games are an active experience. Why is that, I wonder? I'd like to make a game that, when a Mother sees her child playing it for the first time, she thinks, "Ah, good! My child is old enough to play video games now!" We no longer had the restrictions on scrolling and the number of colors that the Famicom had, so it became much easier to depict things. That was nice. However, before starting Super Mario World we ported Mario 3 to the Super Famicom as a hardware experiment, and even though the colors and sprites were more detailed, it was still the same game. It made me realize that we couldn't just make the same game again: we had to create something new. So it was in that context that we talked about how to make the most use of the new hardware. There was a lot of discussion about it, actually. Anyway, the idea (and maybe it's a joke at first) gets taken to the programmers, and after talking with them and doing some tests, once they can see a general picture for how the game would work, the staff is assembled and things go from there. 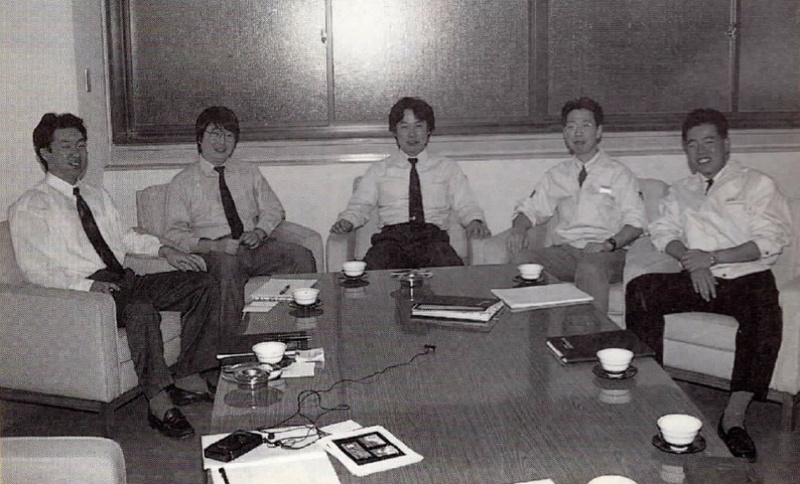 The full translation - along with a 1991 interview with Super Mario World composer Koji Kondo - can be read here. For the new generation of parents, it worked. You can tell from that picture Miyamoto was the Patrick Bateman of the group. "I've never once been embarrassed that children have supported Nintendo. I'm proud of it. That's because children judge products based on instinct. Everyone wants to appeal to people's instincts, but it's not easy." And now...parents are concerned about their kids playing COD.......wow. At this rate, I feel that Nintendo seems to be the only company that gives parents the confidence that their games are safe for kids to play. Well, Link's Awakening did have both Mario and Yoshi cameos, as well as 2D platforming segments. @Pod: Plus the Goombas, as well as the Chain Chomps. Retro articles like this are nice, interesting reads. I haven't had many qualms about my kids playing games... until recently. My son would just do only that if we let him. Fortunately he is also interested in the more complex design of games not just playing them and he's six, so he also loves so many other activities, really. It also helps that he always wants everyone to play with him, so he isn't headed towards social isolation. I just think it's important to remember that It's still just entertainment. While you could argue that gaming is working its way towards an important touch stone for forming ideas and discussion of real issues like movies, tv, theater, books, and oral traditions have in the past, it isn't really there yet. It may never get there. It's still a fun pastime. One that I love to indulge in and in fact develop and teach about, but it's hard to say it's an important part of life beyond the great benefits of play in general. Anyway, I find the intent of Nintendo's movers and shakers at this time somewhat noble but there is the other angle that it is also simply good for the future of gaming to have parents that don't look at games as a waste of time. The Wii U doesn't have enough M-rated games. The other consoles don't have enough non M-rated games. They need to find a balance. @aaronsullivan Some really good points there. Indeed, connecting the whole world together has highlighted differences as much as it has allowed closeness. Added to that, freedom of speech is understood rather differently on both sides of the pond and the two views aren't necessarily reconcilable. Concerning video games, a recent example where I thought there was a philosophical element added beyond the gameplay was Typoman. It has a good go at considering the meaning of life; it's a superficial consideration of life lessons, but the ideas come across very clearly. @Damo Erm, the monochrome pic makes me feel old... We had colour by the 1990s, didn't we? Link did end up appearing with Yoshi after all. In Donkey Kong Country 2, if you fail to place in Cranky's "Video Game Heroes" competition; you can see that Link got third and a Yoshi got second. Indeed. Every kid should get a chance to play the classics. Back in 1993 these are the games i wanted to play .. so Shiggy was right ! .. Just have a look at my story of F zero in this video ..
@BakaKnight Yes, I totally agree with you. And I tend to buy too many games just to see my children enjoy playing with these new games or to play new experiences in coop with them (ie Affordable space adventures). @aaronsullivan Well, as for learning stuff from gaming: I have to admit that my hand/eye coordination has improved by leaps and bounds and I imagine that to be so in millions of others. Other than that, you will probably only learn from them if you're interested in entering the industry yourself, so maybe your six year old is one of those persons. @TheRealThanos Just to be clear, I'm not really talking about what you can "learn" from it, but how stories told through different mediums move people to contemplate real-life issues (consciously or unconsciously) there are plenty of examples in gaming already where that is the case from tiny determined indie games to big games with challenging stories. But in all seriousness: for me personally, I almost never get any learning experience from something that is just entertainment. I may enjoy it, but learn from it? Seldomly, if ever. And throughout the years, gamers have taught me more than movies, theme parks or any other form of entertainment you could name, besides sports, obviously.